Here are the Teams that have got through to the Final Rounds. As before, I will be advising all Team Captains and Club Secretaries of their Teams Handicap Points on either Friday 27th or Saturday 28th April. I must remind the Teams who are playing in these 2 Finals that it is the responsibility of the Home Team to provide the Blank Scorecard, a brand new (never used) 40mm Plastic ball even though you will not be playing these Matches at Home. 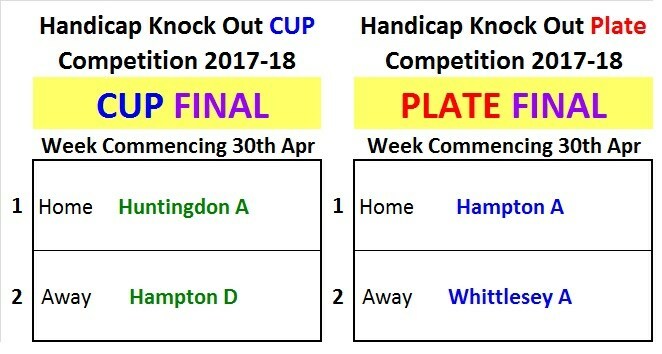 I would hope that as many Club Secretaries, Team Captains and Teams Members will come along and support both Teams at the host venues.